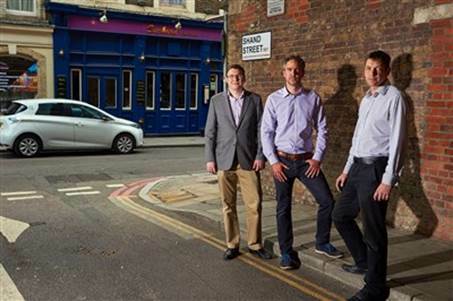 Equity crowdfunders who invested seed capital in a company, via leading equity crowdfunding site Crowdcube, are today to receive a full exit from their investment. In a worldwide first, 63 investors who helped E-Car Club, the UK’s first entirely electric car sharing club for businesses and communities, to raise £100,000 in 2013 are to be given a multiple return on their investment following the sale of the business to Europcar, Europe’s leading car rental and mobility company. E-Car Club was founded by social entrepreneurs Chris Morris and Andrew Wordsworth as a start-up in 2011. It was one of first companies to seek equity capital via Crowdcube where its business model combined with its social purpose appealed strongly to investors. The company combines the increasing popularity of pay-per-use car clubs as an attractive, affordable alternative to traditional car ownership, with the improved performance and reduced price of electric vehicles. E-Car Club works closely with councils, social landlords and community group partners to deliver improved economic, social and environmental outcomes for local residents. E-Car Club already has 19 operational hubs across the UK and expects to continue triple figure growth rates over the next few years. Individuals and businesses can rent a vehicle for as little as an hour. Its acquisition by Europcar marks a fundamental step in the evolution of crowdfunding.